Josiah H. Hayden was born 15 August 1802, son of Josiah Hayden Jr. (1768-1847) and Esther Hayden (1769-1862). He was born in upstate New York while his father, originally from Williamsburg, Massachusetts, was busing harvesting potash and preaching to the local Native American tribes*. When Josiah was still young they moved back to Williamsburg where Josiah and his older brother Joel became industrialists and entrepreneurs in the typical mold of the mid-19th-century: ambitious, hard-working, innovative, dedicated to their community and causes, and successful by moving with the times and adapting to new markets. They started out in Williamsburg, Massachusetts, a small town in Hampshire County in the western part of the state. The town is built along the Mill River which served as a source of power for several of the local industrial operations over the years. In 1809 Josiah’s uncles, Daniel and David Hayden opened up the first cotton mill in Western Massachusetts. The mill was profitable through the War of 1812, but was later abandoned as the price of cotton fell and larger mills were built elsewhere that could produce more cotton thread more cheaply. The mill sat empty from 1818 until 1822 when Joel Hayden and James Congdon purchased the property, rebuilt the dam, dug a canal and started making power-looms for weaving broadcloth. In 1827, Congdon withdrew from the business and Joel was joined by his younger brother Josiah. In 1831, Joel and Josiah began moving away from the door locks and harness trimmings they had been making after the looms became obsolete, to make japanned buttons, tin buttons, button-molds and metal-shanked lasting buttons. Buttons were a big item in a day when shoes, dresses, suits, pants, and pretty much everything else were held together with buttons. Unfortunately, in 1832, early on a Sunday morning in November, the factory building was completely destroyed by fire. Fortunately, they were insured for $2500. The next Spring the brothers began to rebuild. The new building was three stories, and measured 64 feet by 32 feet. Later they added two wings of two-stories each making it 104-feet total in length. Upon reopening, though, the two brothers split their business in two different operations. Joel began experimenting with improvements on the metal-shanked lasting button and eventually came up with a design for the first flexible-shanked lasting button made in the US. These would naturally replace the sewn buttons made by Mr. Williston of nearby Easthampton, so Hayden and Williston entered into business together and eventually employed about 200 people, mostly women. In 1848, Williston bought out Joel Hayden and moved the button making to Easthampton, but by then, Hayden was on to other things. Joel eventually ran a larger cotton mill with 400 spindles, made door locks in another foundry, and eventually became quite successful, and rich, making brass plumbing fittings. When the button factory was rebuilt in 1832, and Joel went off to invent the flexible-shaft lasting buttons, Josiah continued making japanned buttons and button-molds. Metal button making at the time used a lot of similar equipment to making steel pens. You have to prepare the metal, often with furnaces and rollers. You need presses to impress designs and shape the sheet metal, ways to polish and finish the items, and then operations to box and ship them. While continuing the button business, which was consistent, but probably not terribly exciting, Josiah decided to branch out into making these new, hot items, steel pens. In 1839 he brought in Andrew Adams, of Middletown, Connecticut as foreman and began to make steel pens in a part of the button factory. Josiah Hayden was personally connected with the business until 1845 when he sold the steel pen business to the brothers Williston and William Ezra Thayer, who moved the business to Williamsburg village. I’ve found one reference saying that the Thayers continued making pens until 1856 and in the Massachusetts Register for 1852, under Hardware, you find this entry which is additional evidence that steel pens were still being made in western Massachusetts. What these pens were called, is still unknown. They may have continued the Hayden brand, but you don’t find any references to them after 1844. It looks like yet another mystery still to be solved. From the beginning, Hayden was not out to innovate with his steel pens, but to imitate. He took as his model the very successful pens from James Perry. They were even labeled as American Perryan Pens. While they may have been unoriginal in shape and finish, that is not to say they weren’t good quality pens. As proof, Josiah entered the pens into the annual fair of manufactured goods held by the American Institute in New York City. In his first year, 1841, Hayden received a silver medal, and seems to have been the only steel pen to be awarded a prize. But starting in 1842, the first year his new rival, C. C. Wright, entered, poor Josiah Hayden was fated to come in second every other year he submitted an entry, in 1842, 1843 and 1844. Josiah also opened up an agency at 5 Platt St. in New York City with his younger brother Philanthropus “Peter” Hayden to sell and distribute the pens. Josiah stayed in Haydenville, as that part of outer Williamsburg had become known, while Peter was in New York. The Hayden brothers were significant in their community not just as rich industrial powers, but also as dynamic and contributing members of their society. Josiah Hayden was a lay preacher in the local Methodist community and he and Joel were instrumental in the building of the Methodist church. Joel and Josiah were especially active in the abolitionist movement and Josiah is recorded on a petition to the US House of Representatives as “Josiah Hayden and 35 other citizens of Williamsburg, Massachusetts” objecting to the admittance of Texas into the Union as a slave state. In 1838, the community of Haydenville was formed and got its first post office. Josiah Hayden was its first post master. Joel and Josiah also donated the land in Haydenville for the Haydenville Cemetary and the first person buried there was their father, Josiah Hayden, Jr.. Joel and Josiah also built houses next to each other, across from the factory. These are now listed on the National Register of Historic Places. In addition to their industrial pursuits, the Hayden brothers invested in many other side businesses in the area. In 1838, Joel and Josiah opened a general store, mainly catering to their workmen. They operated this for five years doing a business of $25,000 a year. They ran the store for a while before selling out. Josiah came back to it in later years, running the store for a couple of years with his partner Sereno Kingsley after another owner died. And In 1846 Josiah joined with two other wealthy gentlemen to found a bank in nearby Northampton. Joel was active as a Director on the board of a local railroad and his influence was seen as important in the town being connected to and given a stop on that railroad. Joel went on to become active in local politics before expanding his sphere of influence in later years eventually becoming Lt. Governor of Massachusetts from 1863-1866, during the whole of the Civil War. As a side note, I also wanted to mention another pen-related phase of Josiah Hayden’s amazing life. After Josiah sold off his steel pen business to the Thayer brothers, he joined with Rollin L. Dawson of Syracuse, N.Y. and began to make gold pens at the old steel pen factory. He continued this until 1848 when he sold the business to Dawson and two locals who had worked with him in his various businesses. Dawson, Warren & Hyde manufactured gold pens and eventually pen and pencil cases, pen holders and fine jewelry from 1848 until at least the 1860’s. In 1855, Massachusetts took inventory of the various industries doing business in the state. In Boston there were two gold pen manufacturers and the previous year they had made 6,500 pens with a capital investment of $3,500 and employed 6 people. Dawson, Warren & Hyde, on the other hand, way out in the wilds of western Massachusetts, that same year, made 80,000 gold pens, using a capital investment of $25,000, employed 13 men and 12 women. Their gold and silver pencil case business manufactured 40,000 items, captial of $12,000, and employed 24 men and 11 women. And their steel penholder business made 6,000 gross penholders with a smaller capitalization of $3,000 and employed 4 people, 2 men and 2 women. Here’s a Dawson, Warren & Hyde gold pen holder and pen. Picture is courtesy of the Williamsburg Historical Society, Ralmon Black, Secretary. Josiah Hayden went on to dabble in various businesses in New York and Ohio, while Joel stayed in Haydenville. The Haydenville Manufacturing Co. continued even after Joel’s death in 1873 and a devastating flood in 1874 that destroyed the original factory and much of the town. The factory was rebuilt in 1876 and continued in operation as a brass works into the 1950’s when it was purchased by the Sterling Faucent Company who operated it for a few years before closing it. Today, the Haydenville Historic District encompasses the old Brass Works factory, the Hayden homes, the Congregationalist Church, the old school and several other buildings in a delightful slice of a 19th-century industrial community. You can find Greek Revival, Gothic Revival and Italianate styles of architecture in the several buildings. The historic factory has been restored and houses offices, studies and, for a short time, the Hilltown Cooperative Charter School. 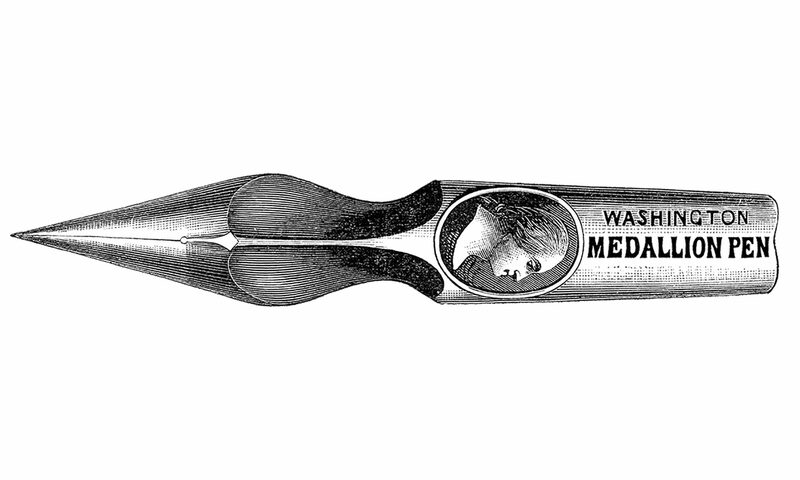 Hayden pens never made a major impact on the history of steel pens in America. They were one of the top American pens of their day, so in that respect they helped set a higher standard for American-made, but they were short-lived and soon forgotten. They’re never mentioned in any of the subsequent histories written not even 40 years later, but that does not mean their impact was as soon lost. While Josiah Hayden didn’t make pens for long, his operations did live on past his interest, in the form of the elusive Thayer brothers, and then the gold pens of Dawson, Warren & Hyde. Josiah Hayden and his brother Joel are also wonderful examples of the better kind of early industrialists and important parts of the story of the building of America. It is forgotten makers like them that have inspired me to write this blog, to try and recapture some of the lost history of one small part of American industry. Mr. Ralmon Black, the Secretary of the Williamsburg Historical Society, without whose very generous help I could not have filled out much of this story. Local historians are amazing resources whose passion and commitment to keeping alive the stories of their communities is the true preservative of our common history. Unless otherwise attributed, any facts come from one of these two sources, and sometimes both. Birth and death dates are from birth and death records found on Ancestry.com Any mistakes or omissions are mine alone.